During a match, each alliance works to score points by positioning �floppies�, their robots, and the �puck� on the playing field. Each alliance will compete using two team-built robots, four robot operators, two human players, and four coaches. Floppies are light weight, pillow-like objects with Velcro-loop material located in its center and around its perimeter. The puck is a short, octagonal platform that rolls freely on caster wheels. Only human players and robots may directly interact with the floppies. 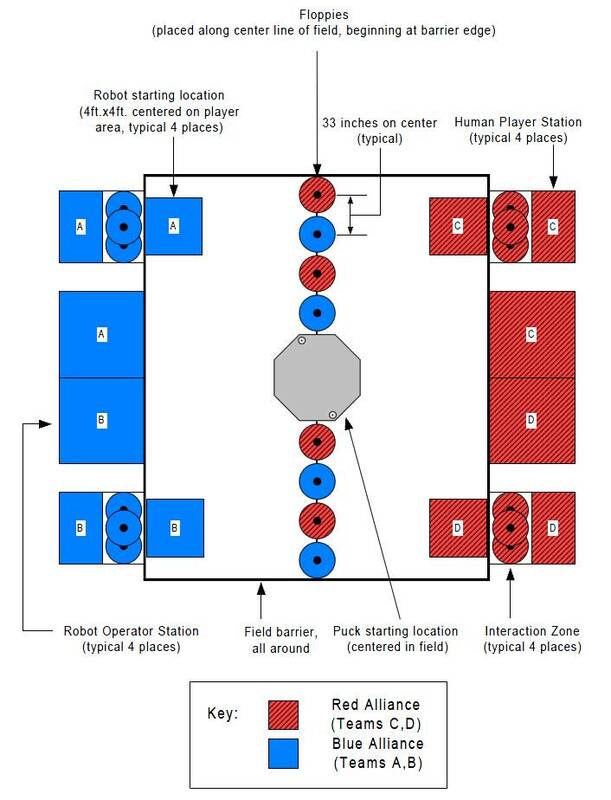 The robots will compete within the bounds of the playing field, while the human players will be located at stations just outside the playing field. Basic information about the layout of the playing field is located below in Section 1.2.3. Each match will last two minutes. In order to win a match, an alliance must score more points than the other alliance. Each alliance will receive one point for each of its floppies that is over the playing field, not in contact with the surface of the playing field, and less than eight feet above the surface of the playing field. Each alliance will receive three points for each of its floppies eight feet or higher over the surface of the playing field. Any robot on the puck will multiply its alliance�s score by three. An alliance is awarded a score multiplier of two if the puck is positioned wholly within the opposing alliance�s end of the field. All multipliers are cumulative. Thus, if an alliance had all ten floppies above eight feet, had both robots on the puck, and the puck was positioned wholly within the opposing alliance�s end of the field, their score would be 30x3x3x2 or 540 points. Note that 540 is the highest possible score. The alliance with the most points wins the match.